This morning there is no civil war in the Republican Party - last night voters settled it by clearly saying 'NO" to amnesty for illegal aliens, NO to corrupt big government and cronyism, and YES to repealing Obamacare, real border security and a strong national defense. Next to Harry Reid and Barack Obama last night's biggest loser was Tom Donohue and the U.S. Chamber of Commerce. None of the Republican winners ran on their agenda and most ran away from it as fast as they could. So, there will only be a continued “civil war” in the Republican Party if the national leaders of the Party’s establishment fail to listen to what the voters said last night. The real heroes this morning, and they can't be thanked enough, are the millions of grassroots conservative voters, many of them members of the Tea Party movement, who held their noses and worked and voted for establishment Republicans they hadn't supported in the primary, but who earned their support by campaigning on the issues they cared about. These people were and are truly patriots who put aside their self interest in what they saw as one last opportunity to save our country. 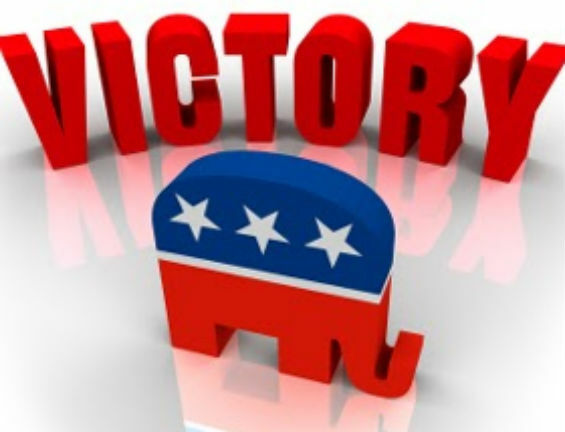 To them belongs this great victory for conservatives last night, and make no mistake about it, it was a campaign that was, especially in its closing phase, run and won by nationalizing the election on one big conservative issue: undoing Obama's disastrous attempt to fundamentally change America. This includes repealing Obamacare, no amnesty for illegal aliens, border security, national defense, especially destroying the threat of the Islamic State, and ending the culture of lies, lawlessness and corruption with which Obama is poisoning our government. Karl Rove isn't going to admit this, but even if the establishment got their candidate in the primary, to win they had to nationalize the election and run on conservative themes. The establishment-backed candidates who struggled to close the deal with voters -- such as Thom Tillis in North Carolina -- finally got the momentum they needed to win when they publicly and clearly took conservative positions on border security, national defense and Obama's culture of lies, lawlessness and corruption. But we conservatives also got some help from the Democrats. This year the Democrats made the same mistake some military leaders make; they fought the last war. Gender politics and the Republican war on women lie didn't sell in race after race when the real war on women by ISIS and the Islamic State, and Obama's failure to confront and destroy it, was there on TV every night. So our victory is won, now our job is to hold Republicans to the promises they made to get elected. The RINO establishment is nothing new...same ol' same ol'. Submitted by dcrawford71 on Wed, 11/05/2014 - 13:28. The GOP establishment is STILL progressive...they have NOT changed. It's still "wool over little brother's eyes time". Look for the same old hollow rhetoric with minimal departure from the 'grow bigger government' MO. Last night was all theater...nothing really changes toward righting this country.